As the economy continues to fall deeper into a recession copper theft is on the rise. Some studies report an over 57% increase in the past year alone. Copper theft leaves air conditioning units completely destroyed, requiring home and business owners to replace expensive equipment for a fraction of the cost worth of copper. The average homeowner loss is $5,000-$6,000. For commercial spaces with much larger square footage the cost is often substantially higher and can cost up $30,000 or more! Saving money is important to everyone in today's economy. Why risk losing your hard-earned money to random copper theft? 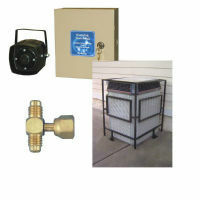 Protect your investment with our rugged and affordable A/C cages.